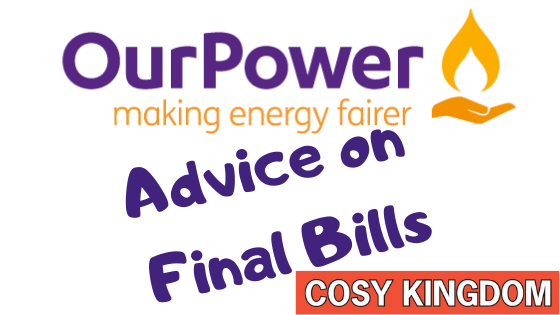 To help customers who were previously supplied by Our Power we’ve written this blog to help you deal with your final bills from the company. Our Power ceased trading at the end of January 2019 and as part of the ‘Supplier of Last Resort‘ process, Ofgem, the energy regulator, appointed Utilita to take over Our Power supplies. It will be Utilita who is responsible for collecting outstanding debt, and returning any credit balances. Unfortunately, during their time in operation, Our Power had problems with their billing systems which meant that some people found themselves in debt. Also as they ceased trading in the middle of winter, people paying by direct debit could find themselves in debt until the summer averages out their energy consumption. If you haven’t already received it, you should expect your final bill soon. It is important that you makesure this bill is accurate. If you wait, you may have difficulty challenging an erroneous bill. You will still owe the money for the energy you used, so it’s important that you deal with it. If you receive your final bill and your account is in credit, good news! The new supplier Utilita will be responsible for paying this back to you and the credit balance will be added to your account. If you have decided to switch from Utilita – this should be on your final bill from them. If your final account is in debit, you will need to pay the balance. Utilita will be collecting this on behalf of the administrators of Our Power. We’d advise speaking to Our Power to ensure this is accurate first. If you disagree with your final bill, it is important you challenge it with Our Power as soon as possible. Their call centre is still staffed by a handful of call handlers. But please be aware there may be long wait times before you can speak to someone. Our Power had issues with their billing systems and like all suppliers, could make mistakes. It’s important to make sure your bills are correct so you’re not paying money you’re not due. There are a few things we’d advise looking out for. This means that a supplier can’t ask for money owed for energy used more than 12 months ago, if they didn’t bill for it in that 12-month window. When Our Power were operating, this was voluntarily set at 6 months. Make sure to ask if the back billing principle can be applied if you haven’t received a bill for some time. If you have a direct debit set up with Utilita (as your current supplier) for ongoing energy consumption – they may try to take the full amount owed to Our Power alongside your usual direct debit as a one-off payment. If you cannot afford this get in touch with them. If you’re going to struggle with a large debt there may be other options available. Get in touch with our friends at Citizen’s Advice & Rights Fife who will be able to advise on other ways of handling debt. Need help? Our advisors can come to your home and assist with any billing or debt issues you may have. All of our advice is free and impartial. You can request a visit through our booking form or alternatively give us a call on 01592 807930.